Located adjacent to Flores Island Provincial Park on Flores Island, Gibson Provincial Marine Park offers sheltered anchorage in Matilda Inlet. The park is home to a natural warm spring, contained in an open concrete tank, located on the shores of Matilda Inlet. A non-maintained historic route connects the warm springs, which are considered to be of therapeutic value, to the broad sandy beaches at Whitesand Cove. This route once provided access to a life-saving telegraph line and an old homestead. Gibson Marine, immediately south of the Nuu-chah-nulth community of Ahousat, also provides access to the “Walk the Wild Side” route, a route that extends 10 km from Ahousat to Cow Bay. Most of the route follows sandy beaches and trails cut across headlands to join with the next beach. At this time, muddy and slippery sections are present on this route. Visitors from around the world come to explore Clayoquot Sound, and Flores Island is one of the most popular destinations for kayakers, who can find ample opportunities for camping and wildlife viewing from the Island’s beautiful sandy shores. Have equipment available to hang food in the event food caches are full. Due to high frequency of wolves coming into campsites during the night, BC Parks is advising against campers sleeping outside their tents. Park visitors are advised to not bring pets to Flores Island. Dogs are a high level attractant to wolves and other large carnivores. Protect your pet – keep them at home. Please do your part when recreating in wolf country and help keep wolves wild. Please click the links for specific information on how to avoid wolf encounters and to practice proper backcountry etiquette. If you encounter an aggressive wild animal, report it by calling the Conservation Officer Service 24-hour hotline toll free at 1 877 952-7277 (RAPP) or #7277 on the Telus Mobility Network. Bring your own drinking water as potable water is not available in the park. There are two freshwater creeks in the park, but all surface water must be boiled, filtered or treated prior to consumption. The trail is best accessed from the village of Ahousaht. Water taxis to Ahousaht generally depart numerous times a day, from the 1st Street dock in Tofino. There are currently no BC Parks fees to camp within Gibson Marine Provincial Park. For more information or to purchase permits to hike the Walk the Wildside Trail, please contact the administration office at info@wildsidetrail.com or call 1 250 670-6803. Gibson Marine Park is located in the central portion of Clayoquot Sound, north of Tofino on the west coast of Vancouver Island. The park is located on the south side of Flores Island and is accessible only by boat from Tofino. Boaters can reference marine chart #3674 and #3673 for more information on this area. Water taxis from Tofino and Ahousat offer access to the park via the Village of Ahousaht. Nearby communities include: Tofino, Ahousat, Hotsprings Village. History: This park lies in the traditional territory of the Ahoushat First Nations. 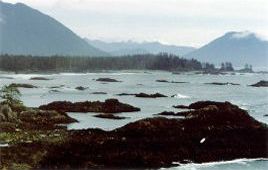 Gibson Provincial Marine Park contains many Nuu-chah-nulth First Nations heritage sites, including middens and Culturally Modified Trees (CMTs). Much of the park was a gift from the W.F. Gibson family. Gibson Marine, immediately south of the Nuu-chah-nulth community of Ahousat, also provides access to the “Walk the Wild Side” route, a rustic route that extends 10 km from Ahousat to Cow Bay. Most of the route follows sandy beaches and trails cut across headlands to join with the next beach. At this time, muddy and slippery sections are present on this route. The trail is best accessed from the village of Ahousaht. Water taxis to Ahousaht generally depart from the 1st Street dock in Tofino. For your own safety and the preservation of the park, obey posted signs and keep to designated trails. Shortcutting trails destroys plant life and soil structure. Portions of this park are open to hunting for specific species. Hunters must have valid licences and tags. Please refer to current printed Hunting and Trapping Regulations Synopsis publication for closures and regulations. Backcountry areas are not suitable for dogs or other pets due to wildlife issues and the potential for problems with wolves, bears and cougars. Pets/domestic animals must be on a leash at all times and are not allowed in beach areas or park buildings. You are responsible for their behaviour and must dispose of their excrement. There have been incidents involving wolves killing dogs in this park. BC Parks is strongly advising park visitors to not bring their dogs to the park. There is no designated swimming area, however there are opportunities for ocean swimming in this park. There are no lifeguards on duty at provincial parks. While small fires are allowed, we encourage visitors to conserve the environment by minimizing the use of fire and using stoves instead. If you do have a fire use small pieces of wood that will burn completely. Build your fires below the high tide mark. and do not burn live wood, burn drift wood instead. Never build fires next to or near beach logs, this could lead to a forest fire. Never leave your fire unattended and practice “Leave No Trace” camping ethics. A pit toilet is located at the most easterly beach in the park. A campsite consisting of 3 tent platforms is located on the easterly end of the park near the sand dunes and pit toilet. Random wilderness camping is also allowed but please use the pit toilet when possible. Please practice “Leave No Trace” camping ethics. Gibson Provincial Marine Park is accessible year round. Gibson Provincial Marine Park is accessible year-round. Please practice “Leave No Trace” camping ethics.